I came to Brighton Center in a time of need. 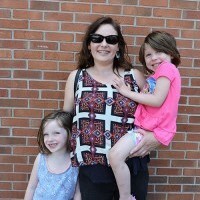 I am a single mom with three kids and three years ago, we were homeless. Brighton Center provided the resources to help turn that around and get us back on our feet. It has always been a dream of mine to open a day care. I grew up with younger siblings and had my oldest son at 16, so it is ingrained in me to care for people. My classmates nicknamed me “Momma Mya” because I genuinely took interest and befriended everyone. Even though I was a mom, my high school never judged me or turned me down from participating in anything. They helped out with parenting classes, clothes, and so much more. 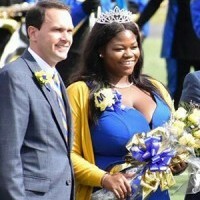 My leadership led me to become vice president of my graduating class and I was also prom queen. The Jean Brown Scholarship Fund was established in 1995 after the passing of Jean Brown, who was an Emergency Assistance Advocate at Brighton Center from 1985 until her death in 1995. She had a wonderful talent for reaching our young people and helping them see a future for themselves. 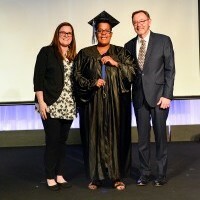 This scholarship honors her memory by offering encouragement to youth through a scholarship for post-secondary education. I first heard about Brighton Center through an after-school program called Youth Leadership Development (YLD). When I first started, it was a day camp in the summer. We would do volunteer work, go on field trips, or just meet up to do activities. Youth Leadership Development for me was guidance at a young age; a way to keep me occupied and on the right path. It also helped me realize how important it is to volunteer in my community. In 2013, I was introduced to Brighton Center through a neighbor. In the beginning, my dog and I would visit two or three times a week to receive free food in the lobby. A relationship developed and those two to three times a week quickly developed into our daily walk. After a while, the Family Center introduced me to a Resource Advocate to visit on a monthly basis. I signed up for USDA Commodities that assist with food as well as other necessities. My husband and I always dreamed of owning our own home - a place where the kids can play soccer and T-ball in the backyard, run around with the dog, and create lasting memories. We just never knew where to begin. 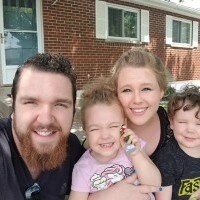 Our credit wasn’t the greatest, we didn’t have savings, and buying a home was a big step but Brighton Center’s Financial Wellness program helped us the entire way. They gave us the resources to overcome these obstacles and we were able to make our dreams a reality. As of May 11, 2018, we are officially homeowners. I came home to Northern Kentucky from Bardstown, Kentucky after a relationship that didn’t work out. I was 39 weeks pregnant, scared, and alone. I didn’t really know how I was going to parent my daughter or even if I would have the support back home. My dreams for the future have been achieved. I graduated, landed a job, built self-confidence in myself that I can finish a degree, and everything in between. 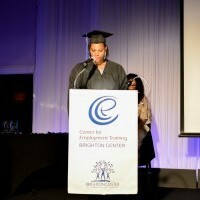 Brighton Center not only equipped me with emergency assistance, a debt free education, and an externship through the Family Center, they offered me a job once I graduated. I couldn’t be more blessed with this opportunity to advance in myself. 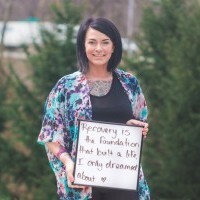 I am an alcoholic and drug addict that has been sober since September 1, 2015. It still seems extremely surreal to have the amount of sobriety that I do. Colton wanted to do more after graduating high school but wasn’t having any luck finding steady work. 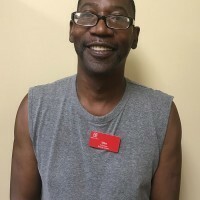 He struggled with a disability his whole life that made getting a secondary education and reaching his goals difficult. 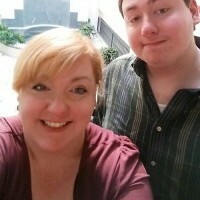 Colton and his mother Rachael heard about Kentucky Career Center (KCC) and sought help to make their dreams a reality. Salissa, a mother of five children, came to Center for Employment Training (CET) in 2015. The goal was to earn her GED and become a Medical Assistant. She was referred to CET by Brighton Center’s Family Center where Salissa utilized emergency assistance and financial services previously. Her children were introduced to Brighton Center’s Youth Leadership Development program where they were able to build leadership skills and conduct community service projects through this afterschool program. Salissa wanted to be a role model for her children and felt having no high school equivalency was holding her back and restrained her from finding higher wage employment to support her children.